Gerhard “Gerd” Schöpfel was born on 19 December 1912 at Erfurt in Thüringen. He was originally a member of the police force but transferred to the Luftwaffe in 1936. Following completion of his flying training, Schöpfel was assigned to I./JG 233 which became I./JG 135 and, finally, I./JG 51. 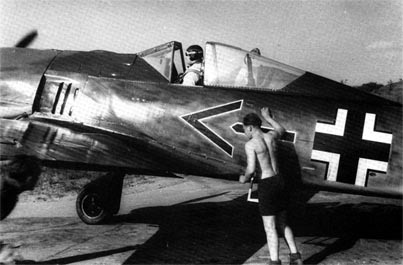 Leutnant Schöpfel was posted to join I./JG 26 in 1939. Oberleutnant Schöpfel took command of 9./JG 26 on its formation on 23 September 1939. He gained his first victory during the Battle of France, a RAF Hurricane near Courtrai, on 19 May 1940. He added to his score over the beaches of Dunkirk during the evacuation of the British army. He was very successful during the Battle of Britain. On 18 August 1940 he shot down four Hurricanes in one sortie over Canterbury, England. Two of his victims in this engagement were notable RAF fighter pilots Donald McKay (20 confirmed and 4 damaged victories), who baled out wounded, and Kenneth Lee (7 confirmed and 1 damaged victories), who also baled out wounded, both of 501 Sqn, RAF. Hauptmann Schöpfel became Gruppenkommandeur of III./JG 26 when Göring promoted Adolf Galland (104 victories, RK-Br) to Kommodore of JG 26 on 22 August 1940. On 11 September 1940 he was awarded the Ritterkreuz on achieving 20 victories. On 1 December 1941 he was promoted to Major and on 6 December 1941 became Kommodore of JG 26 when Adolf Galland was promoted General der Jagdfieger. Over Dieppe on 19 August 1942 he shot down two Spitfires for his 41st and 42nd victories. Schöpfel left JG 26 on 10 January 1943 to take up the role of Ia (Operations Officer) at Jafü Brittany. He was to serve as Fighter Operations officer southern Italy from July and Fighter Leader Norway from November. On 1 May 1944, he joined III./JG 54 before being appointed Kommodore of JG 4 on 1 June 1944. On 6 August, he was shot down in combat near Schwerin flying Bf 109 G-6 (WNr 440728). He baled out wounded. 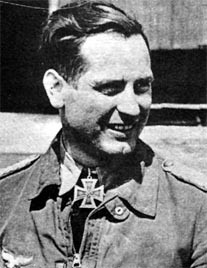 Following recovery from his wounds in November 1944, Schöpfel was appointed Fighter Leader Hungary. In February 1945 he commanded the Luftkreigsschule at Gatow. On 10 April he was appointed Kommodore of JG 6 based in northern Czechoslovakia. He became a prisoner of the Russians and languished in Soviet prisons for four and a half years finally returning to Germany in December 1949. After his release from imprisonment in the Soviet Union, Schöpfel worked as a chauffeur. He later became a merchant and in the early 1960s returned to the aviation field as an executive of Air Lloyd in Bonn. “Gerd” Schöpfel flew 700 missions and gained 45 victories including three four-engined bombers. All his victories were scored over the Western Front.